Railroads changed America as they provided a fast and efficient means of transporting people and goods for long distances. This title presents the early history of railroads and steam locomotives. Trains began as horse-drawn carts that carried coal. Rails reduced friction and increased efficiency. Then came the modern double action high-pressure steam engine. The steam locomotive originated in England, but the technology quickly jumped across the Atlantic ocean and came to America. The United States is an enormous country and the vast distances that needed to be covered resulted in constant innovation and new developments. 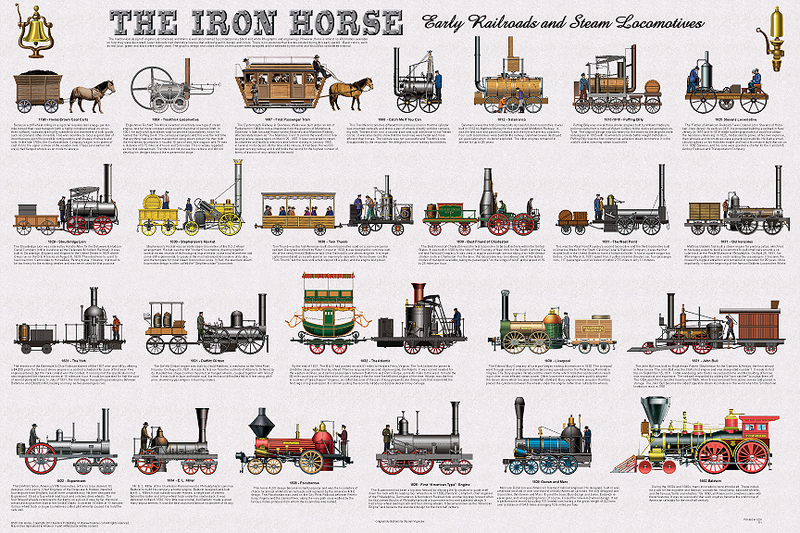 This poster includes the early English engines but concentrates on the many innovative American designs and shows all the famous early engines. They include the 4-2-0 Jarvis and the 4-4-0 "American design," that dominated our nation’s railroads for over a century. Includes all of milestone engines made in the U.S. prior to the Civil War.